Anyone looking for a super-quiet, efficient and cost-effective supply of quality compressed air for their workshop requires a user-oriented solution. 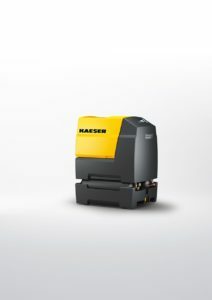 With the space-saving i.Comp 8 and 9, Kaeser Compressors introduces a completely new compressed air supply concept that has been specifically developed with this field of use in mind. These units are tough, powerful, compact, easy to maintain, efficient and much more. At the heart of the new i.Comp family is a new drive concept, which provides a multitude of advantages. It delivers the necessary power to cover the required compressed air demand with infinitely variable control. i.Comp family reciprocating compressors can operate with 100 percent duty cycles. Intelligent solutions – such as drawing the air for compression in through the piston head – ensure exceptional filling performance and, as a result, outstanding efficiency. With a volumetric flow rate of 412 to 580 l/min, the i.Comp Towers can be used for a wide range of workshop and trades applications and assure a constant pressure of up to 11 bar with absolute operational reliability. Made from roto-moulded polyethylene to enable optimum corrosion- and impact-resistance, the attractive sound enclosure not only hides an advanced all-in-one compressed air station comprising a compressor and a refrigeration dryer, but also keeps sound levels to a minimum and helps retain system value. Kaeser’s field-proven Sigma Control 2 controller allows pressure preselection and infinitely variable speed operation, as well as connection to a master controller such as the Sigma Air Manager 4.0. Since i.Comp Tower systems deliver oil-free compressed air, no oil enters the compressed air supply itself. This in turn eliminates the potential for accumulation of oil-contaminated condensate that would otherwise have to be carefully disposed of. In addition, there is no need for oil changes or oil inspection, which of course further reduces overall service costs.